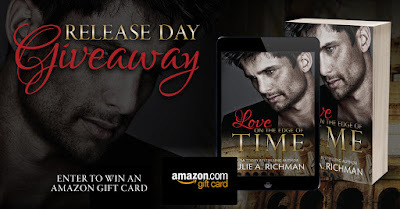 Love on the Edge of Time, an all-new standalone story about a love too great to be bound by time, from Julie A. Richman is LIVE! I’m celebrating the release of this unique and captivating story with a $10 GC GIVEAWAY! •LIKE or follow Kindle Crack Book Reviews on Facebook or Instagram www.instagram.com/kindlecrack (or both). • TAG a friend, LIKE, and SHARE this post! SBPR is responsible for this giveaway, and it is not sponsored, administered or endorsed by Facebook/Instagram. Giveaway is open to US residents only! Open for 72 hours.